I've been thinking about doors lately. Not front or back doors, but opportunity doors. Seems like I've been walking through a few 'new' ones these past weeks. What I find rather interesting is when I pass through one door of possibility, I see brand new ones further down. Doors I did not see until I'd passed through the very first one. A few of my doors... last fall I volunteered to be the blog moderator for the InScribe blog (a group blog for writers), which opened a door to be invited to be a presenter for the Fellowship's fall conference, doing a workshop on blogging. Which then led to a question about doing something for our fellowship's website which opened another opportunity to write an article for our quarterly newsletter (I'd never submitted anything to it before). All small things, but every opportunity I took had a definite impact on what came next. Without going into more details, those little decisions brought me into a whole new world of opportunity and growth. Sometimes, like in that old TV game show, we don't know what's behind Door #1, 2, or 3, but we won't get any prizes if we don't choose to move through at least one. 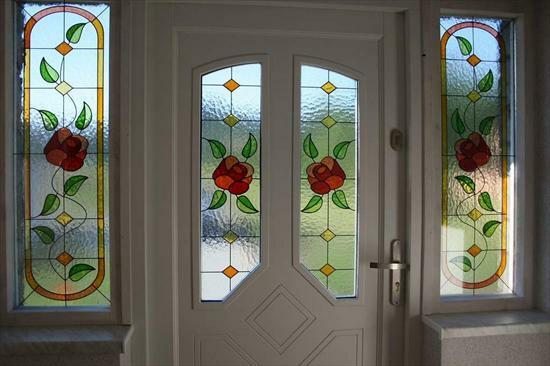 Of these two doors I posted today, which door would you choose... the one with the stained glass windows or the one painted pink? In this case, I think I'll choose both! Who says I can't? Who says you can't? and may they lead you to your beautiful life. I always feel lifted up when I read your thoughts. As for opening doors, that is a good reminder for me to make decisions. I usually hesitate before opening a new door because I'm not sure or clear on whether or not to proceed. I'm worried that I'm opening the wrong door, and I'll miss out on the 'right' door. But the way you explained it so beautifully, when I finally decide to open a door, I will grow and learn through whatever is on the other side and ultimately, that's what's important. Becoming is more important than doing. Interesting that we both see Mother Theresa's words in this principle. She told somebody once that clarity was the last thing he was clinging to and that he must let go of it. Instead of praying that God would show this man which decision to make, she prayed that he would trust God. I love this analogy Brenda. It's so true that simply opening one door can lead to so many more exciting and challenging doors. 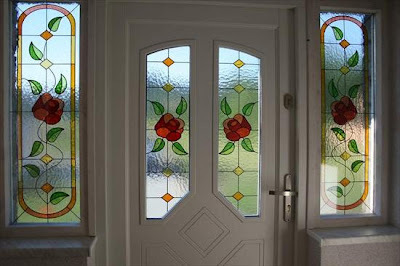 And if I had to choose, I'd choose door number 1 - the stained glass door. I can just imagine the opportunities waiting on the other side of it. Oh Brenda I just loved this post! 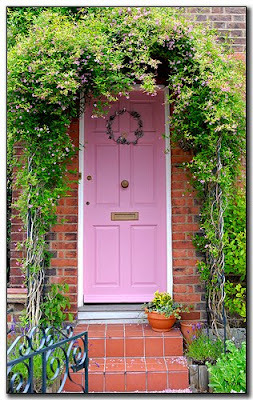 We face "new" doors every day and it is a wonderful journey traveling through all of them! Enjoy your day! By the way I would pick both doors too! Good words, Lin, not to let fear hold us back. Pam, enjoyed hearing Mother Teresa's thoughts about clarity....wow! That is amazing. How many times does He promise that He's directing our steps, so we should have total confidence that when we step out -- or open doors -- He'll ensure we're not going to fall off the edge of the world. And about making mistakes? I've been spending some time with Ann Vertel (Millionaire Mindset Method) and she tells me that her power team celebrate mistakes and failures, because it means they tried something and moved forward. They see everything as a learning growing experience. So it's a win (even when it's a failure). Who said, if you fall down 6 times, just get up 7. Sandy, isn't that a pretty door. I found both on glitter graphics. Always enjoy hearing from you! These are wonderful thoughts - both in your post and in the comments. Thanks to Pam for sharing Mother Teresa's thoughts. I long for clarity, but trust is what I need. Great post! We never know where we will be lead if only we walk through the doors and take the opportunities offered. It's putting our hand on the doorknob first that slows us down sometimes. I have been determined to keep knocking and going through them. Doors...opening and closing, exciting and scary. I'm happy for all your doors that have opened up for you, especially the InScribe in the fall. Now which door would I choose? Well, one door is going in the other is going out! Probably the one going out. I think I'll try both doors too. But I'm definitely trying the stained glass one first. Enjoyed reading about doors. Life is made up of opened and closed doors. I like how you put this post. Sometimes I believe we walk through open doors and we are too busy to realize what we just did. As for which one I like? I would say both of them. Thank you for the gentle reminder, to look for new and opened doors. Great post! Interesting how opening one door can lead to another...and another...and another. An endless maze of opportunity. Your blog is beautiful and congratulations on your new success. I will be coming back to this blog. May God bless you indeed.